Description: This is a Smooshees Cinderella set from the Cuddler Tales line. 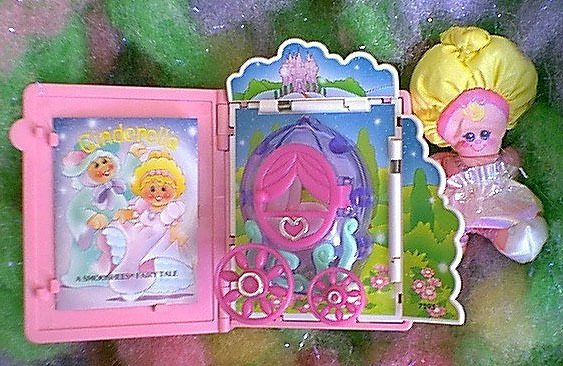 The set includes a plastic book that opens to reveal a pumpkin-shaped carriage inside that the accessory Cinderella figure can be smooshed into. 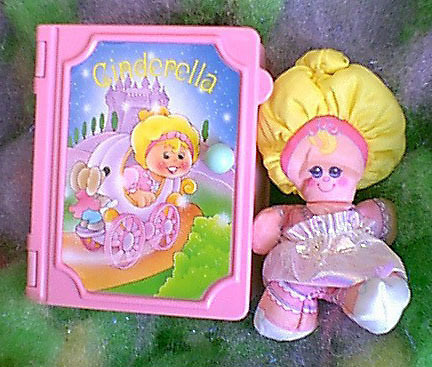 The set also includes a small soft-cover book titled "Cinderella" that fits in the inside cover of the plastic book. Theis set was designed for children ages 4 years and older. FPT16200 - Cinderella - Stuffed cloth female Smooshee figure with a pre-printed face and clothes. She has light yellow fabric "hair" with a stitched bun on top. She has a pink printed crown around the top of her head, and a bit of blonde printed hair in the top center of her head. Cinderella has purple eyes, a round pink nose, round pink cheeks, and a pink line smiling mouth. She has a pink printed gown and white printed slippers. FPT16201 - Pink hard plastic pop-open "book" with a hinged cover that opens to reveal an attached carriage inside. The carriage has a hinged door, and the accessory Cinderella figure can be smooshed inside. FPT16203 - Small soft-cover booklet that fits inside the hinged flap (book cover) on the book mentioned above. This book has a picture of a Cuddler Cinderella and Fairy Godmother, and "Cinderella" across the top in pink.